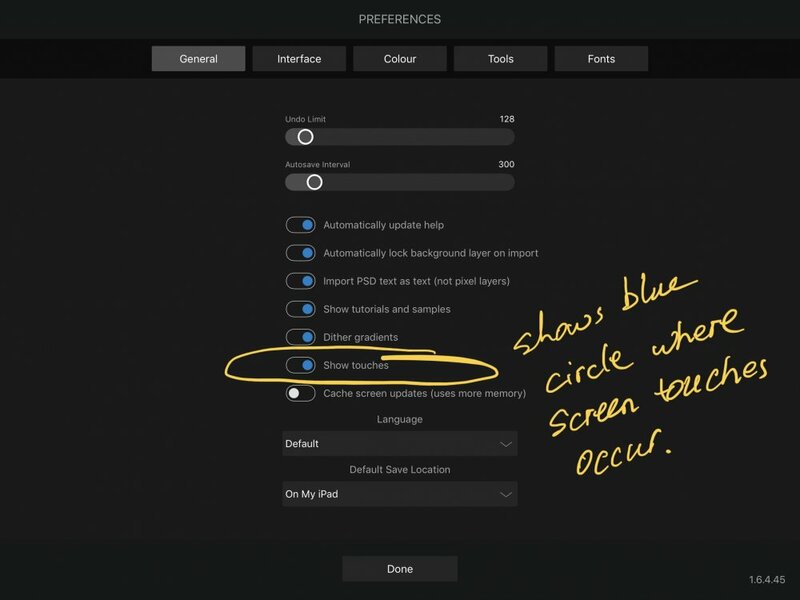 Please observe in the attached video how the panel for selecting a custom color in the sidebar smoothly slides in and out, but its size is abruptly changed at the end of the animation, which is distracting. It’s a little hard to see what you are doing in the video. Helps to turn on 'Show Touches' in Settings. I see a larger menu slide out then slide back in. Where do I find the option "Show Touches"? The only solution I found on Google is "Assistive Touch" under the Accessibility settings. What you can see in the video: after tapping the bottom button in the right sidebar, a panel with many coloured circles slides in and abruptly expands at the end, then after tapping the button at the top of the right sidebar the panel slides out again and the containing panel shrinks abruptly. I'm not sure how showing the touches can make the abrupt size change of the sidebar clearer. Show touches enables viewer to see what the poster is 'doing' tocause the screen reaction. Behaviour appears normal. You have a pop out sidebar that is larger than the original sidebar. The 'abrupt' changes are the result of opening or closing the sidebar. To me it appears to be normal behaviour. Fast is generally perceived as good. As @DM1 covers this is due to the Swatches studio being larger than the Colour studio. Thanks, I didn't know there is a setting in the app itself. "Fast is generally perceived as good" in my opinion is not a good argument here: why is there an animation at all for sliding the Swatches panel in if faster is better? If there was no animation at all it would be less confusing, because then the panel would appear all at once, but currently there is an animation followed by an abrupt frame change which you would not expect, in fact the first time I experienced this I wondered what had happened. What I would expect is that the height of the sidebar is animated at the same time as the new panel slides in (in which case the overall animation would still have the same duration), or after the panel has slidden in (in which case the overall animation would be a little longer, as you pointed out).